Potiki is such an interesting book, it would make a great choice for book groups. It is the story of a Maori community’s struggle to regain control of their ancestral lands. Having had their land acquired to build an airfield during WWI, these landholders were dispersed into rental accommodation so that it became almost impossible to sustain their culture and traditions. But as is so often the case in land rights matters, a dispirited and apparently ‘broken’ people were rejuvenated by a charismatic leader who used the legal system to facilitate the return of the land – not all of it, but enough for those who wanted to, to resume farming and rebuild community life. A pragmatic people, these Maori accepted that even though they did not agree that their land had been ‘improved’ by the building of sports grounds and club-houses, they had to pay recompense for these ‘improvements’ – and since they didn’t have any money, they had to forego the return of some of their land. It was the use of this adjacent land for the development of a resort that is the focus of Potiki. Potiki is an education for people like me who know very little about New Zealand or the Maori culture. From this book, I learned that a meeting-house called a wharenui is central to Maori life: it is where the community meets to discuss and solve problems, and welcome visitors. It is not a sacred building, but it is where rituals take place. And it has to be right in the centre of the community. So when the adjacent development needs an access road right through the meeting-house, the small community is vulnerable to great pressure. There are fruitless negotiations; there are implied threats, and eventually both sides take the law into their own hands. Potiki makes no pretence at being even-handed. Roimata, her husband Hemi and their children reject the values that lie behind development but the developers are not only unempathetic, they have (to put it mildly) no redeeming features. Although the community farms at subsistence level and they themselves have some anxiety about the future of their children, they attach no importance to amenities for tourists. They already have a view, they say. They can already go fishing, they say. They can already see wildlife. There is no need to build a Disneyfied resort to please visitors, and it offers no benefits to their community because they (the Maori) never get the good jobs anyway. Some of this writing strays into didacticism, in my opinion. The small community offers a supportive environment for people who are often marginalised in mainstream society. Mary is intellectually disabled; Toko is physically disabled; and Manu has epilepsy. They do not go to school, except for Mary who spends her days cleaning and polishing it. Does this limit their choices, or is it an alternative which offers greater dignity? Is it enough for these children to learn ‘Maori’ science instead of the real thing? Is folk knowledge idealised? When, if ever, is environmental vandalism justifiable? I had no previous experience in reading the Maori language, but I didn’t have too much difficulty working out what was meant from context. However, Aarti at BookLust felt that the use of Maori language was a deliberate strategy to alienate non-Maori readers. Patricia Grace, she says ‘seems to have meant for non-Maori people (pakehas) to feel lost and out-of-place in the reading’. Is it too risky for an author to use a minority language in the global book market? Toko is said to have a special kind of ‘knowing’, Are the ‘spiritual’ elements of the story convincing? Roimata seems to be a kind of bridge between Hemi’s view that the farm is ‘enough’ and her older children’s desire for more. She loves Hemi and understands his contentment but she sees the reality too: there is dignity in working the land but there is also its shabbiness, the subsistence diet, the vulnerability of their position and the shabby clothing. Is it possible for a lifestyle like this to survive in the 21st century? James and Tangimoana – who did go to school and on to university – bring back skills learned in the wider world for the benefit of the community that are crucial in their battle to take on the developers in the media and in the courts. What are the risks for traditional communities in encouraging their children to learn the ‘system’ so that they can use it when they need to? Contemporaneous with reading Potiki and the battle of the Te Ope people to regain their land rights, I was also reading Ochre and Rust by Philip Jones about the transitional period between Aboriginal Australians as masters of their own destiny and their subsequent relegation to an underclass of white colonial society. This marvellous book uses museum artefacts from this period as a springboard for exploring history in a remarkable way which – like That Deadman Dance by Kim Scott – shows that there were some men of good will on both sides of these vexed issues. Much as I admired Potiki I did find myself wishing that it had been a little less polemical…but perhaps some stridency was necessary in order for Grace to get her point across in the 1980s. 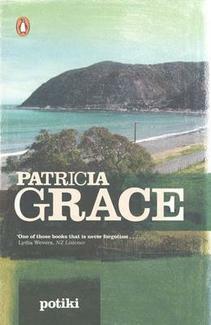 Potiki won the 1987 New Zealand Fiction Award. Curious about why this review is suddenly getting so many hits, I went exploring via Google. Ah ha! It’s been chosen as a senior secondary text for students in New Zealand – and I am so pleased to see that in this case anyway students are being offered entry into the wonderful world of adult books instead of YA. PS It so happens that I finished reading and blogging this book just as news broke of the catastrophic Christchurch earthquake. To donate to the relief appeal, please visit Red Cross Australia, or Red Cross Britain. The Red Cross site in NZ is obviously swamped at the moment, but Australia and Britain are running dedicated appeals and the money will definitely get to where it’s needed. Sounds like an interesting book. I haven’t read an NZ book for a while. I gave Ochre and rust to my brother for his 50th a couple of years ago. He works in the Tasmania Museum and Art Gallery and loved it. But, I haven’t read it myself yet. I think you’d *love* Ochre and Rust. I’m taking my time over reading it, just a chapter each weekend, and writing reams and reams about it in my journal because it’s so thought-provoking. I’m going to have to precis my review considerably!! It’s good to know it’s available in the UK Stu. I was worried that no one overseas would be able to get hold of it. I read Grace’s short stories last year and have planned to read her novels this year. I loved her stories and their insight into Maori culture. I am reading this book right now for my IB Extended Essay on the manifestation of colonialism in colonized countries. Some of your comments here really gave me some ideas. Even though I’m only halfway through, I have to admit that I really loved this book. I have always been interested in specifically New Zealand and the Maori culture for some reason. Could you recommend me any other novels/short stories about the effects of colonialism in NZ? And what are some key facts to approach post-colonial NZ literature? What should I keep in mind as I write? So far, I’ve found the cultural and ethical dilemmas, language, the mixture of oral tradition in narrative, “national identity” problems and the whole thing about historical and economic effects of colonialism. Hello Pirilti, I’m glad to see that my review has given you some ideas, IB is a tough gig, isn’t it! NZ is an interesting choice for study because unlike other colonised places but like Australia the indigenous people are a minority. (About 15% Maori, I believe). Unfortuntely I’m not best placed to help you with what you want to know. As you can see if you click New Zealand in the COUNTRY OF ORIGIN category, I haven’t read very many NZ books – and that’s partly because they’re not so easy to get hold of here in Australia. I do know that there are bookshops there that specialise in Maori issues – perhaps you could try Beatties’s BookBlog (see http://beattiesbookblog.blogspot.com/) – he may be able to refer you to someone who can help you. What about the US? Or Canada? Both have tiny, tiny indigenous populations, surely? Yes, Marie, you’re right. I was thinking more of countries like India and countries in Africa where the colonised people were always in the majority. its a good book. the only bad thing about is that it doesn’t have a maori-english glossary. Hello Stuns, and welcome to chatting about books at ANZ LitLovers. As an Aussie reader with no experience of Maori language I didn’t mind the Maori. Most of the time I could figure it out, and when I couldn’t I just kept going. ps: congratulations for the blog! I really enjoyed this book, and a few of Grace’s other books, and whilst they sometimes feel a bit unfinished I do appreciate her style an her message. Anyway the thing that’s bugging me is this: why do you say Manu is epileptic? Was it stated and I missed it or did you assume that? I’m just wondering! Also what actually happened to Toko at the end? I came away from the book not entirely clear on what brought his death?! Hello Felicity, I’m so sorry, it is such a long time since I read this book, I really can’t remember the details well enough to answer the questions you’ve raised.